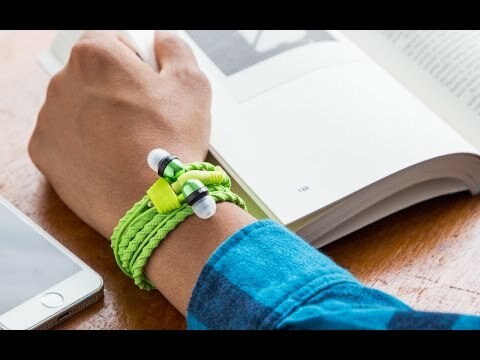 Wearable headphones that don’t tangle. 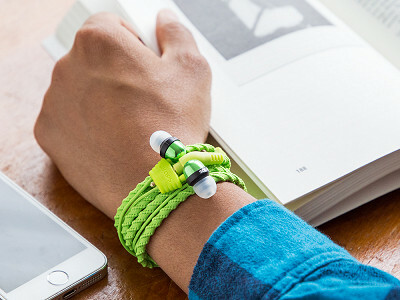 These braided wristband headphones go from device to decoration in a single motion. 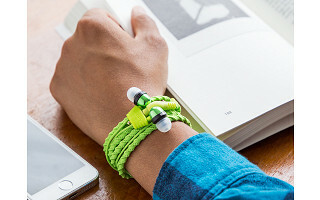 Instead of slinging your headphones around your neck, Wraps transform into an undercover bracelet you wouldn’t suspect of being more than an accessory. Plus, their textured fabric exterior prevents any tangling. Whether you’re listening to some quality tunes or just keeping them on your wrist, they’re always conveniently accessible. We are really excited to be showcasing our products with The Grommet and hope you enjoy your Wraps as much as we do! Welcome to a life without tangled headphones! If you have any questions, feel free to ask! Do they happen to be water proof? I think this is a fab product. I am a tastemaker and have thousands of followers. I will promote it if you send me one. The black one. I will send you the post. Let me know if interested. Hi Barbara, shoot an email to [email protected] and we can assist. How do they perform as headphones? Are you looking to come out with different ear fittings? I generally don't like the traditional ear buds. I like ear fittings like the iphone and samsung galaxy headsets. @Ralph At the moment, no... But each pair comes with a set of Small, Medium and Large Silicon tips to ensure a comfy fit for almost everyone! I really like the idea, but now that Apple has gone to no headphone jack your Wraps would require the Lightning headphone jack dongle. So having headphones handy is pointless without the adapter. Can the dongle wrap up with the headphones? We are working on a lightening cable and bluetooth versions that will be released early next year! @Ashley Not everyone has an iPhone 7. Right you are, James. Samsung for life! @Carl - Thanks for your response. I'm all in for the bluetooth version when it becomes available. Hi, Do you have to take the headphones off to use the microphone? 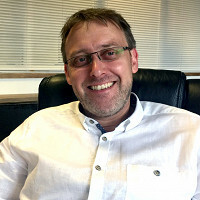 @Jonathan Hi Jonathan, nope; you keep the headphones in and can simply speak freely when you answer phone calls... The mic just picks up your voice. The button on the mic also can be used to play/pause music and skip tracks! What is the life expectancy of the wiring? Most of my headphones get yanked out of the phone jack accidentally, and eventually one speaker stops getting signal because of a bad connection near the plug. @Daniel Glad you asked! Because we've designed our headphones specifically to 'Wrap' around, they are extremely hard wearing, far more so than 'normal' headphones! Each part of the design is carefully considered to avoid any faults... Should you experience any issues at all, we offer a 24 months warranty against any faulty products. I own a boutique yoga studio. My clients would love these!! I also teach 12th grade English Literature. My students will think these are very cool! Do you have plans for retailing in stores? How might I obtain a pair? They'll probably be a crowd pleaser anywhere you go, Jennifer. Shoot an email to our Wholesale team at [email protected] and they'll let you know when Wraps is available. You can see the rest of our products on there, too. @Jennifer We've got some great yoga studio items on our wholesale platform! I look forward to helping in any way! Ink and green but only see camo, coal and denim...none of which appeal to me. Thanks! 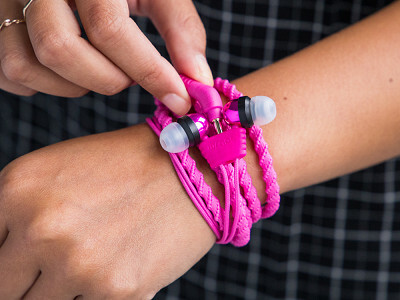 These braided wristband headphones go from device to decoration in a single motion. 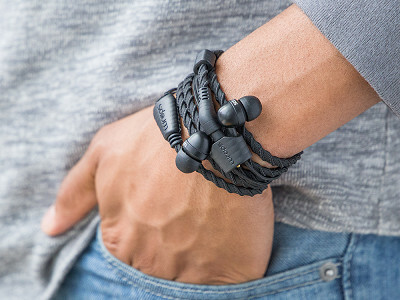 Instead of slinging your headphones around your neck, Wraps transform into an undercover bracelet you wouldn’t suspect of being more than an accessory. Plus, their textured fabric exterior prevents any tangling.